It’s Friday night at Cherry Hill Lanes in Dearborn Heights, starting to get late but plenty of time for a game or three before closing. Someone still likes Britney Spears enough to play “Baby One More Time” on the jukebox, and her voice rises over the sounds of crashing balls and pins. Four couples have set up in lanes 42 and 43, punching their names into the electronic scorekeeper – Champ, Madina’s Mom, Adam, Leila – and changing into bowling shoes. The temperature outside is in the teens, so the long cardigan sweaters the women wear don’t register as modest clothing, but the headscarves do. The group is Hussein and Mariam Charara, two of Mariam’s sisters, plus their husband and fiance, and Hussein’s sister and her husband. 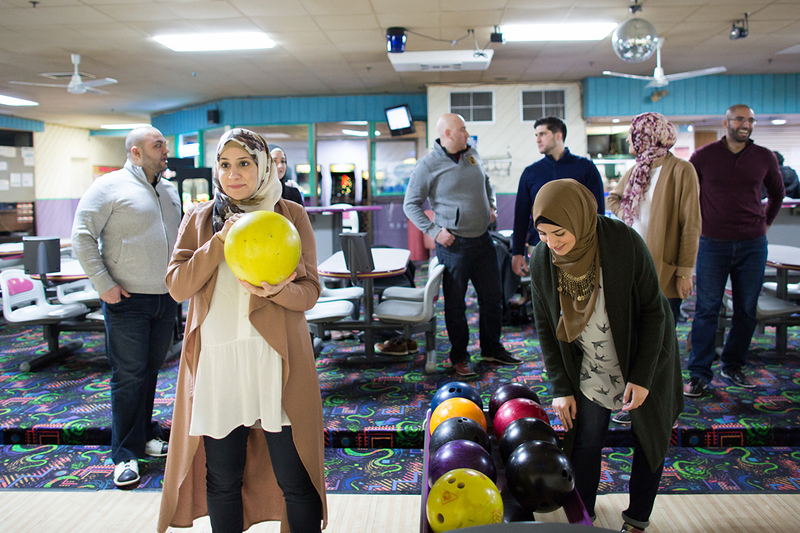 Eight young Muslims, American-born of mostly immigrant parents, Dearborn-raised, educated in public schools, capping off a night of halal pepperoni pizza and socializing with one of the oldest and most mundane entertainments Michigan has to offer – bowling. “An exciting Friday night with Muslims,” Hussein said. The Chararas are participating in Michigan Divided, a Bridge exploration of 11 Michigan individuals and families throughout 2017, in an attempt to pierce the bubbles in which they, and the rest of us, live. Part of Dearborn’s large, growing and increasingly native-born Muslim population, the Chararas have a 1-year-old daughter, are expecting a son in April, and both aspire to be teachers, Hussein when he finishes his degree this spring, and Mariam when their children are older. This Friday night is a week-ending night off for the couple, one of a shrinking number before the baby arrives in April. Hussein is particularly busy, student teaching at Edsel Ford High School in Dearborn and working in his family’s furniture store in Detroit. Mariam cares for toddler Madina and shops online for the double stroller she’ll need soon. It’s also a welcome break from the news of the past two weeks, as President Donald Trump’s executive orders temporarily banning refugees, and halting immigration from seven majority-Muslim countries have rattled the Muslim community, even this group who have little expectation of being directly affected by it. Adam Fahs, married to Mariam’s sister Hanadi, is a orthopedic surgery resident at Beaumont Hospital’s Royal Oak location. He’s an uneven bowler, throwing gutters and strikes, and between turns says the immigration ban is of special concern for the area’s foreign-born doctors, who must complete a set number of hours of training to achieve various certifications. One ill-timed vacation, family emergency or other trip outside the country could lead to not being allowed to re-enter. This group is safe from a ruling that targets immigrants, and by any outward measure they’re doing fine -- young, well-educated, employed. But a persistent fake-news article about their hometown resurfaces from time to time, claiming the city is ruled by Islamic sharia law. The Arab International Festival, a community event dating from 1995, was cancelled after noisy anti-Islam demonstrators, one carrying a pig’s head on a stick, made it a scene of conflict. On a recent vacation Mariam and Hussein took to Los Angeles, a woman sitting at a nearby table in a restaurant made a snide comment about Mariam’s hijab. A trip to the movies might bring a trailer for a movie like “Patriots Day,” about the Boston Marathon terror attack. A gunman in Canada entered a mosque in Quebec City and opened fire, killing six. The outrages and irritants pile up. But she was also heartened by the thousands of non-Muslim Americans who turned out to clog airports, wave signs and angrily rebuke the new policy. The following weekend, her husband was still calm. “We have the Constitution on our side,” Hussein said, preparing to take his turn at bowling. “I’m not worried.” Mariam, who watched Trump’s ABC News interview with David Muir, said she “honestly felt like it was a (Saturday Night Live) skit.” There’s a lot to process. Between frames at Cherry Hill Lanes, her family and friends shared more of Hussein’s attitude. All said they felt Saudi Arabia – home of the Wahhabi sect of Islamic fundamentalists – is more of a threat to American interests than the seven countries named in the executive order, home of many refugees to Metro Detroit in recent years, particularly Iraq after two American wars fought there. Hanadi Fahs, Mariam’s sister and Adam’s wife, is a social worker in the Novi Community Schools District, working with special-needs children. There, she stands out; she counts only four Muslims in her workplace, and she is the only hijabi (women who wear head coverings). But after the executive order, the district's assistant superintendent called his 24-year-old staff member personally. Like her sisters, like her husband, like her brother-in-law, Hanadi said she always felt fully American, growing up in Dearborn. A different kind of American than many, perhaps, but one who “never felt affected” by current events elsewhere in the world. Now, that’s different. In many ways, even as a small religious minority, the Chararas live in their own bubble. Both attended Fordson High School in Dearborn, where the student body is almost entirely of Middle Eastern extraction and overwhelmingly Muslim. But Mariam didn’t start wearing a hijab until she was 19, resisting pressure from her mother to do so. “It has to be something you choose to do, and I wasn’t ready,” she said. Her closest friends from high school, also Muslim, leave their heads uncovered. Like Judaism, Christianity and other faiths, observance and practice falls along a continuum. What drives them crazy is how their religion – peaceful, civilizing, empathetic – is misperceived, especially now, with an administration they view as hostile to their beliefs. The lanes are emptying out, and it’s time to go. Outside, an Audi stops by the front door, and some teenage boys jump out to throw a ball back and forth over the roof. They laugh. Arab music blares from the car’s speakers. “Don’t embarrass us!” Hussein’s brother-in-law, Ahmad Bazzi, calls to the boys in Arabic.They jump back into the car and, like a latter-day Archie and Reggie, speed away into the night. not well executed edict that amounts to a Muslim ban. one one hundredth of one percent of Muslims worldwide. And Muslim countries are the target of terrorists too. We don't judge Christians based upon the actions of white supremacist hate groups. Why should we falsely judge all Muslims based upon the actions of a very few? Increase vetting of Muslim immigrants but why are American citizens detained? Haste, sloppiness and lack of care in implementing rules helps no one. Tyranny in the defense of freedom promotes neither freedom nor safety. Muslims should read about how the immigrants during and after the world wars were treated in the United States. My mother tells me of the problems her folks encountered. Nothing new under the sun. They need to be patient, treat everyone like they want to be treated, try to blend in a little more, and things will work out the way they hope. We are all inconvenienced by terrorism. This is a 90 day vetting process. I don't see how the charara's life will be disrupted as long as they don't leave the country during this period. As respects bigot idiots that The Chararas encountered in California, pure hatred but please don't confuse me with them because I support Trump's agenda. Since it appears that Trump supports those hatemongers if you support Trump you can't escape supporting all of those Trump supports. You can't pick and choose. I know some people who refuse to admit they support Trump. Are they ashamed? I think they should be. I certainly would be. I do not think the end justifies the means. And to blindly support an arrogant demagogue and know nothing bully merely because Trump "speaks his mind" is beyond my comprehension. Merely because somebody "speaks their mind" doesn't make what they say true, smart or a wise thing to do. What they say could be a lie, stupid and even dangerous. You can't let anger get the best of you. Unfortunately, supporting Trump's agenda is the problem that allows for the development of the hatred by which you wish to not be identified. Hatred is blind and unthinking spite towards a person or idea. My spite is with open eyes and careful thought based upon what Trump has said and done in the campaign and so far as President. I don't think that's hate but rather wise and prudent protest against an arrogant, loud mouthed bully and fraud. If it looks like a duck, walks like a duck and quacks like a duck it must be a duck. If Trump sounds and acts like a bully and demagogue then Trump must be a bully and demagogue. By their actions ye shall know them. Now, there's a guy who hasn't fully assimilated! As if "having the Constitution on (y)our side" means anything when the plutocracy shifts into high gear. I think the Lansing area is very welcoming of people of diverse backgrounds. I would love to share this area to those who are seeking acceptance. Welcome to America, you have more supportive people than might appear to be the case. Most Americans believe in the acceptance of immigrants and "new starts." We just have to find a way to bring folks together to celebrate the real American values. I see that The Bridge is into "filtering" comments that do not jive with the narrative that it is trying to portray regarding the temporary travel ban. How "fake news" of The Bridge. That being said, I challenge you ( Ms. Derringer, Messrs. Zeman, Bebow and Power) to watch the following video clip from a contractor, who until VERY recently was working in Iraq, and who also asked the local population about their feelings towards Americans. After watching the complete video (it's a short video), ask yourself again about how safe we'll really be if they are allowed into America? Do not confuse our policing of our comments sections for tone, propriety, etc., with "filtering" to agree with our narrative. Your near-constant presence in these threads should be proof of that. I deleted one of yours because I believed it crossed the line. That's all.